A former heavyweight boxer left a man with a life-threatening stab wound when trouble flared at a remote log cabin retreat. Declan Fusco and three pals had joined four women who were enjoying and annual get-together at the lodge in Otterburn, Northumberland, in July 2017. Newcastle Crown Court heard the group had spent "hours" socialising in the hot tub before arguments started over noise and missing vodka. In the bloodshed that followed, tree surgeon Guy Dunn, 24, suffered a stab wound to his chest from an eight inch blade that punctured his lung and an artery and required multiple operations. Bethany French was pushed by Fusco, 27, during the trouble and fell onto a cabinet. 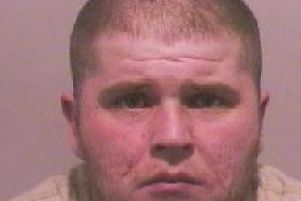 Fusco, who suffered a cut to his hand from the knife during the violence, left the scene in his BMW, which he crashed in Jedburgh and spat in the face of a police officer who came to arrest him. The court heard there was "blood stains on the walls of the log cabin" after the incident. Mr Dunn said in a victim statement: "I genuinely thought I was going to die from my injuries". Flormer Olympic hopeful Fusco, of Rydal Crescent, Peterlee, admitted unlawful wounding, common assault, driving while disqualified, having no insurance and assaulting a police constable. Prosecutor Claire Anderson told the court the men had initially been a "welcome addition" to the womens' summer get together. But she added: "In the early hours some of the girls wanted to go to sleep. What followed was a number of arguments over keeping noise down." The court heard one such argument resulted in Fusco rowing with Miss French in a bedroom, where he "pushed her backwards" and she fell into a cabinet. Miss Anderson said the pair "both apologised to each other" afterwards and "hugged each other", which brought that confrontation to an end. The court heard Fusco was next involved in an argument with Phoebe Sampson, who accused him of drinking her vodka and he "became aggressive". As a result of that row, Miss Sampson summoned her boyfriend Mr Dunn. It was during the struggle between the two men, who ended up alone in the kitchen, that Fusco was cut to the hand and Mr Dunn received the near-fatal chest wound. Prosecutors accepted Fusco's basis of plea that Mr Dunn had been first to produce the knife and what happened afterwards was self defence gone too far. The court heard after both men were injured Mr Dunn was taken to a bedroom where pals attempted first aid before he was taken to hospital and Fusco left the scene in the BMW. The knife was later found in the hot tub. Judge Amanda Rippon jailed Fusco, who has previous convictions for violence, for 25 months with a ten year restraining order to keep him away from Mr Dunn and Miss Sampson. The judge told him: "An eight inch knife was used in the struggle that ensued between you and Mr Dunn. "What happened next, subject to your basis of plea, was Mr Dunn picked up the knife during your argument. You grabbed his arm and struggled with him. "As you grabbed hold of his arm, the knife penetrated his body and you received a cut to your hand." Judge Rippon said spitting into the face of a police officer is "childish and pathetic". Jane Waugh, defending, said Fusco had been accused of being "rude or impolite" to Mr Dunn's girlfriend and "the next thing he knew Guy Dunn had the knife". Miss Waugh said Fusco was "extremely upset" about the injury that was caused to Mr Dunn and has vowed to stay away from trouble and settle down with his family in future. Miss Waugh added: "He accepts he is never going to be the Olympic boxer that, at some stage, he thought he was going to be. "That part of his life is over really. He has some thoughts about training as a professional boxer but whether that will will ever come to fruition he does not know. "He volunteers at boxing clubs, trains young boxers. "His new job is as an electricians apprentice."